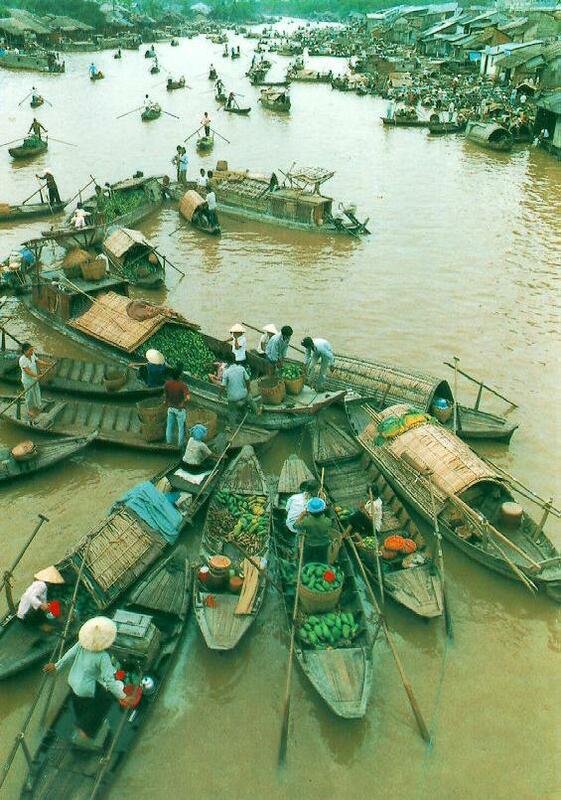 Is there anywhere on planet Earth that so teems with life and industry as the Mekong Delta? Anywhere where agriculture and fish farming are so intensively practiced? In thinking that one day I'll come back here and find multi-storey rice paddies stretching to the horizon, I suspect I'm only partially dreaming. Flying into Ho Chi Minh City (Saigon) gives as good an introduction as any to the wonders of the Mekong. From the air the landscape resembles an intricate anatomical chart, only in shades of green and brown rather than white and red. Every tributary of the Mekong River bifurcates, then trifurcates and multifurcates into thousands of veins, arteries and capillaries. Then, linking this vast drainage network are hundreds of manmade canals, giving the countryside the appearance of an Eastern Venice. 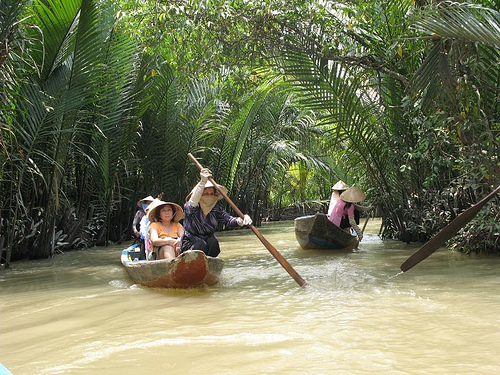 "Getting out into the Delta" makes for a popular day trip from Saigon. Some visitors go further afield, to the provincial capital of Can Tho - and fewer still to the city of Chau Doc, near the Cambodia-Vietnam border. But until very recently (early 2001) it was impossible for foreigners to go by river across the Cambodian border. Now, all this has changed. The Victoria Sprite and her larger sister vessel the Victoria Princess, for the very first time, offer a river service from Saigon all the way to the Cambodian capital Phnom Penh. No doubt whatsoever, this trip is destined to become one of the world's great river journeys. As with any new venture, the Victoria boat service is still getting its scheduling in order. So on this occasion I get to travel by road from Saigon, to join the boat at Chau Doc. The road trip provides another take on Mekong life, which from any perspective is fascinating in its ever-changing variety. We take the near-empty Saigon Parkway, a multi-lane freeway leading from nowhere to not-anywhere - or more precisely to the new satellite city of Saigon South, with its Saigon Wonderland amusement park, Korean-Japanese School and executive golf course. I'm wondering whether this is still Vietnam, or whether perchance we have suddenly been teleported to another planet. Then, abruptly, we hit the main road to My Tho. Here, near the Mekong's ocean outfall, the river-drenched plains are hugely fertile. Women stand chest-deep in the water, planting rice. Ducks swarm in their thousands. Barely a square millimetre of potential cropland is wasted. Religion is big time in this region. The indigenous Cao Dai sect, with its strange "revelation through séance" philosophy, has impressive temples in Bén Lúc and Long An, their near-psychedelic murals inviting inspection. The priest at the Bén Lúc temple is welcoming and obliging, showing us some of the pantheon of French and Chinese saints that adorn the eclectic interior. To the uninitiated, Cao Dai seems to be either a religion for the future or a belief system from another planet. Through My Tho (the furthest that the vast majority of travellers venture), both the riverboats and road traffic head on through the impressive city of Vinh Long. From here, paths diverge slightly. The Victoria riverboats take a through channel to Can Tho. However, we decide to take a shortcut through to Sa Dec, on the Hau Giang arm of the Mekong. The horizon around the riverine settlement of Lo Gach is a sky-sea of brick-kiln chimneys, their belching fumes turning the air into a hazy smog. Everywhere are bricks - stacked bricks, bricks on pallets, broken bricks used as pavers or heaped in vacant allotments. It has just rained, and I feel like I'm living inside a hot, damp sponge. We pass over numerous canals, where the steady flow of river traffic suggests that the region is on a totally focussed export drive. Indeed, Vietnam is set soon to overtake Thailand to become the world's leading rice exporter. Across the Hau Giang the big city of Long Xuyên, aglow with sparkling new hotels and apartment buildings, also finds the time to process over 50 cubic metres of Mekong Ca tra fish a day, much of it destined for the tables of Europe and America. Early in the next morning, we board the River Sprite, a spritely vessel indeed. Amazingly enough, I get to ride on the roof most of the way, a prime opportunity that affords a great view of river life. However, the rooftop vantage point is not without its dangers. Inevitably, it won't be very long before someone falls off, and the company bans roof-riding completely. So, the time to take the boat trips is right now! We sail up the Tem River towards the Bassac, the wide southern arm of the Mekong River. Along the way, the riverside teems with life and commerce. Floating shops, service stations and markets complement their land-based counterparts. Then, after about 45 minutes' cruising we reach the Bassac River junction. Here the river widens, becoming nearly an inland sea. But as before, I'm totally bowled over by the industriousness of the riverine peoples. Along the riverbanks, baskets of potatoes and other freshly-harvested vegetables are loaded straight onto barges. Everyone is meaningfully engaged with life, always and everywhere. The border crossing at Tonlé is a leisurely affair. So few people as yet cross the Vietnam-Cambodia frontier here that the whole procedure takes nearly an hour (by the time the relevant stamps have been found, and forms that you'll never need are laboriously filled in). At the same time, much friendly banter accompanies the formalities. The comparison between the two sides of the border could not be more pronounced. By comparison with the hard-working Vietnamese, the Cambodians seem positively indolent. And the results are evidenced in a much lower standard of living - poorer houses, few big river vessels (the only large vessel I see all the way to Phnom Penh is carrying a Vietnamese flag). By comparison with the cultured and sophisticated Vietnamese, I found myself thinking that today's Khmers are lower than a pus-sucker's podiatrist. Of course, I was wrong. The Khmer in fact have their own sophisticated body language, one in which I'm very far from being fluent. Cambodia also has a glorious ancient history to which it can look. This history, epitomised in the temples of Angkor, is a real anchor, a lynch-pin around which the country is slowly rebuilding itself. After the protracted trauma of the genocidal Khmer Rouge era, when most of the country's managers were exterminated, full recovery will take several generations. At Neak Luong, an important town on the Phnom Penh-Ho Chi Minh City Road, we cut across the route of the vehicular ferry that crosses the Mekong. 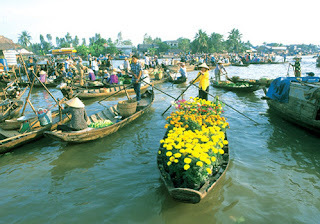 Neak Luong is the gateway to Prey Veng province, an agricultural district starting about 40 km east of Phnom Penh. The name Prey Veng means "long forest" in the Khmer language; but today you see few trees, merely a landscape of vast fields of rich lime-green rice paddies. Prey Veng province is one of the poorest in Cambodia, but thankfully escaped the worst ravages of the Khmer Rouge. While agriculture is slowly returning to normal despite the disastrous floods of 1999, "agriculture" in Prey Veng still means "rice", and little else. This monoculture mentality is something the government is trying to overturn, with extensive plantings of sugar-palms, a tree that yields sugar, fibre, building materials and fuel. Finally, the high-rises of Phnom Penh's skyline become visible. 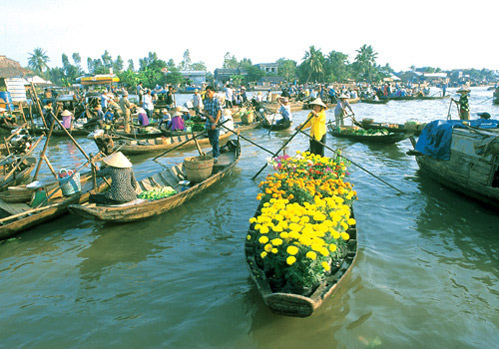 Fronting the Tonlé Sap River, Sisowath Quay (a landscaped boulevard and boardwalk), stretches for about four kilometres. I'm totally stunned to see the transformation that has occurred in Phnom Penh. Sisowath Quay was in my memory little more than a dusty lane, a rubbish-strewn road with potholes so big that a bicycle-rickshaw could disappear into one of them without leaving a trace. But now, in the year 2001, Sisowath Quay is emerging as one of the world's great promenades, with new cafés, boardwalks and landscaping making the whole boulevard one of those rare cityscapes that immediately invite you to linger and enjoy. Opposite Sisowath Quay, the peninsula formed where the Tonlé Sap and Mekong Rivers meet is for now nothing but grazing land for cows and water buffalo. However, things are changing fast. Phnom Penh's Municipal Governor Chea Sophara dreams of turning this area into a "City of Tomorrow", which will attract tourists from around the globe. Work on the giant redevelopment project began in earnest in January 2001. In drenching humidity, I take a walk to the National Museum, with its superb sculpture collection. The Museum is one of the few cultural monuments to survive the Khmer Rouge era. The spires and roof cornices of the Museum nearly seem to puncture the clouds, while the striking red ochre façade stands out starkly against the sky. The Museum's treasures include bronze sculptures from all over the country, particularly showcasing the riches of the civilisation that built the temples of Angkor. In pride of place at the Museum is the uniquely Khmer figure of Harihara, a god said to be half Vishnu and half Siva. In the evening, anybody who is anybody (together with most who aren't) congregates at the Foreign Correspondents Club of Cambodia, right on Sisowath Quay overlooking the River. The FCCC is world-famous, both as a hangout for respected reporters and as a haven for hack journalists. This notwithstanding, the Foreign Correspondents' Club is still a "must" for all visitors to Phnom Penh. Talk may turn to the latest antics of President Hun Sen, but all are agreed that, like the figure of Harihara in the National Museum, the Cambodian leader is a master at carefully balancing opposing forces. A similar balancing act must surely have been the task of those who managed to get the Victoria Sprite service up and running. To travel from Chinese-influenced Vietnam to Cambodia (with its Hindu-derived Khmer culture) is just a short journey in terms of distance, but light-years in terms of bridging ethnic and religious differences. I feel highly privileged to be in on the trip.